For A Quick, Clean Cut. 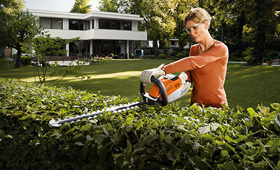 Powerful cordless hedge trimmers for professional results on all types of hedge. These impressive machines operate with a high stroke rate and are fitted with special cutters with a long tooth height for tackling branches up to 22mm in diameter. With a cutting length of 50cm and single-sided special cutters, the HSA 66 is perfect for trimming work in the garden and grounds. With a cutting length of 62cm and double-sided special blades, the HSA 86 plays to its strengths in commercial applications in noise-sensitive areas.